Typical diets in developed countries deliver large amounts of saturated fatty acids and the polyunsaturated omega-6 linoleic and arachidonic acids and low levels of omega-3 fatty acids. Throughout evolution, humans were accustomed to diets providing roughly equal amounts of omega-6 and omega-3 fatty acids. However, during the last 200 years, the ratio of dietary omega-6:omega-3 fatty acids increased from about 1:1 to 20-25:1. Leading health professionals now recommend ratios between 4:1 and 10:1. A healthy balance of dietary omega-6 and omega-3 fatty acids appears to be a prerequisite for normal immune function. Dietary linoleic acid (18:2 omega-6) is a precursor to arachidonic acid (20:4) which in turn is a precursor for pro- inflammatory prostaglandin E2, leukotriene B4, and platelet aggregating thromboxane A2. The omega-3 fatty acids EPA and DHA provide a natural counterbalance, because they serve as precursors for the anti-inflammatory prostaglandins E1 and E3, and decrease the formation of prostaglandin E2 and thromboxane A2. Among other factors, sufficient dietary levels of EPA, DHA and other omega-3 fatty acids are also important in the regulation of normal blood lipoprotein and cholesterol levels. 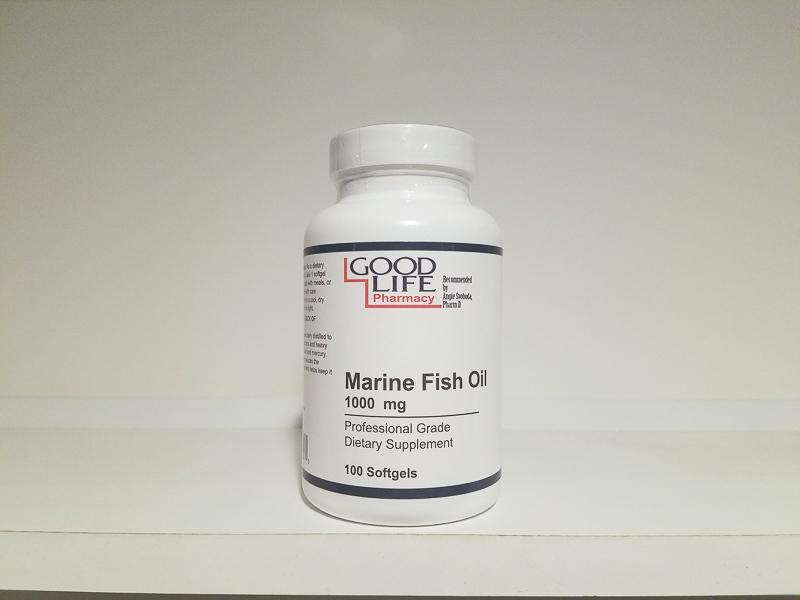 Marine Fish Oil 1000 mg is molecularly distilled to remove PCB’s, dioxins and heavy metals such as lead and mercury. The process also reduces the oxidation of the oil and helps keep it fresh and stable.